Can you believe TONIGHT is the finale of The Bachelor with Juan Pablo? Where did the time go? When we saw this post on The Darling Prepster, we knew it would PERFECT for today's post! We'd also like to welcome Ashliegh Jarzenski to The Monogrammed Life! This will be first of many posts from her! Check out her full bio on our Meet The Blogger page! So I totally dropped the ball on this week's Final Rose Link Up, but was it just me or was this week's episode of The Bachelor a total bore? There was too much crying to hold my squirrel-like attention. Instead of doing a recap, I figured I would show you what I would wear if I were on The Bachelor. Which, I would never sign up for, by the way. This romper looks so feminine and comfortable! I love the crochet details on the back and I might have to get this for spring break! It would make the perfect cover up for my white bikini. Pair it with Jack Rogers and throw on some pearl studs and this would be the perfect lounging outfit for long days at the mansion (or the beach)! 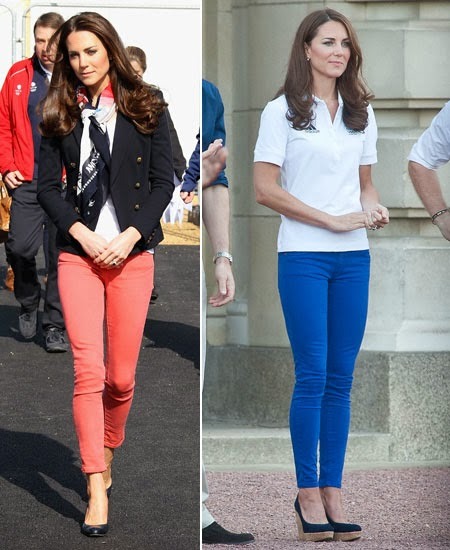 Everyone loves colored jeans. Everyone loves Kate Middleton. Of course a look inspired by the princess herself would be a hit! A pair of wedge heels, colored skinnies, white tee, scarf and a blazer would be my go-to outfit for date night because of its versatility. The Take the Stage Gown on Rent The Runway is to die for, is it not? Keeping it simple with a pair of black minimalist heels and statement earrings, I think this looks is classy and elegant. How could Juan not give me a rose?! What would you wear if you were on The Bachelor? Gotta love the Bachelor... though I do not love Juan Pablo! So excited for the finale tonight!